For the last five years, the San Mateo County Chapter’s Blue Water Task Force has been documenting the poor water quality conditions at Capistrano Beach in Pillar Point Harbor, CA. This enclosed harbor area with little circulation with the open ocean is favored by families with children. The calm water conditions appear safe, but in fact, the often polluted conditions likely pose more of a health risk to bathers than the rougher seas outside the harbor. View the chapter’s data for this Capistrano Beach on the BWTF website. A recent article published by the Peninsula Press gives an overview of the pollution problems in Pillar Point Harbor and showcases the San Mateo County’s BWTF program and their BWTF volunteer-extraordinaire Keith Mangold. As published by the Peninsula Press, Do you know what’s lurking in the surf? Heed the warning signs for beach bacteria. 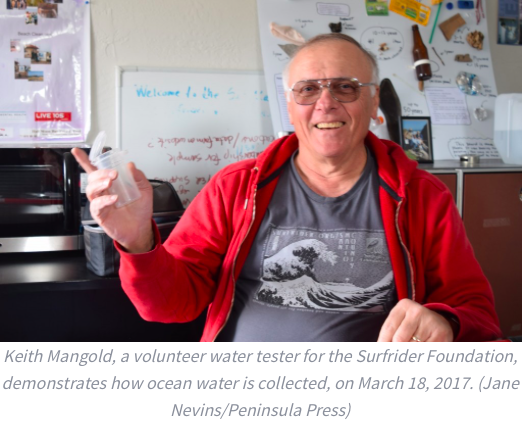 Once a week, Mangold and other Surfrider volunteers sample the water in a plastic vial that looks like a clear 35mm film canister. He puts the samples into an insulated lunchbox and drives back to an old pump house turned ad-hoc lab. The Chapter is excited that this article will help build community awareness of their water quality monitoring program and the pollution problems at Capistrano Beach and hope that it helps motivate local officials and agencies to identify the sources and develop strategies for improving water quality conditions. This article also gives a nod to the Surfer Illness Study that Surfrider participated in through a collaboration with scientists at Southern California Coastal Water Research Project (SCCWRP); University of California, Berkeley, School of Public Health; and Soller Environmental. Learn more about this study and its findings on Beachapedia or read the recently released publication in the American Journal of Epidemiology.